You can’t keep the Lord closed up, locked up, buried, or hidden. Jesus goes where he wants, when he wants, to whom he wants. His presence proclaims and reminds us of God’s undying love for each of us. Be prepared to be surprised: the Lord walks among us. 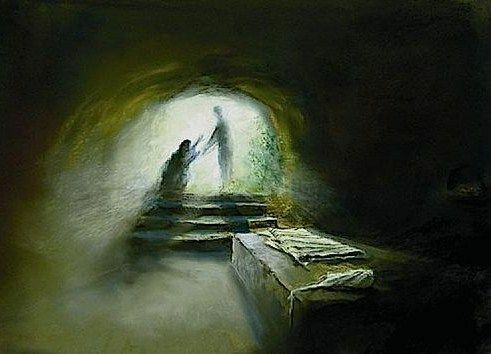 This entry was posted in John and tagged art, Catholic, Christ, Christian, Easter, Gospel of John, Jesus, Lectio Divina, Mary Magdalene, meditation, scripture on April 21, 2019 by Mary Ann. I sometimes feel caught — by circumstances, others’ demands, chronic pain, or mental, emotional, physical, or spiritual distress. The sense of being trapped and in the control of unknown, antagonistic forces terrifies me. In tiny moments of sanity, I remember to come before the Lord to ask for help and guidance. Gradually — and sometimes quickly — God’s mercy reveals the way to freedom. This entry was posted in John and tagged art, Catholic, Christ, Christian, Gospel of John, Jesus, Lectio Divina, meditation, mercy, scripture on April 7, 2019 by Mary Ann.